Robert Herrick. The Parliament of Roses to Julia. THE PARLIAMENT OF ROSES TO JULIA. Of tiffanie or cobweb lawn. The maid of honour unto thee. Guido Reni (1575-1642). 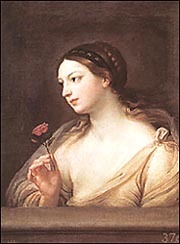 Girl With a Rose. Created by Anniina Jokinen on September 26, 1998.